Construction environments are a bit different from other types of work sites, surroundings are constantly changing and workplaces are often very crowded with all types of workers. XSPlatforms offers a wide range of products to protect workers at height in almost every step of the construction process. We can provide in several temporary, as well as permanent, safety solutions for a wide range of fall protection purposes. Whether it comes to temporary fall protection (PPE) measures or a permanently installed Building Maintenance Unit (BMU), that can be used to hoist during construction, but which will later serve (after the building is finished) as a facade maintenance unit for window washers. The importance of providing safety precautions in the construction industry does not come out of the blue. Fall accidents in this sector have been high on top of workplace-accident-lists for a long time. Take OSHA’s Top 10 for instance, fall protection violations have been the most cited type of violation for years and even more striking, residential construction and unprotected sides/edges have been the number 1 and 2 within this chapter. Combined these two violations alone accounted for approximately 5,300 citations in the fiscal year of 2017 alone! 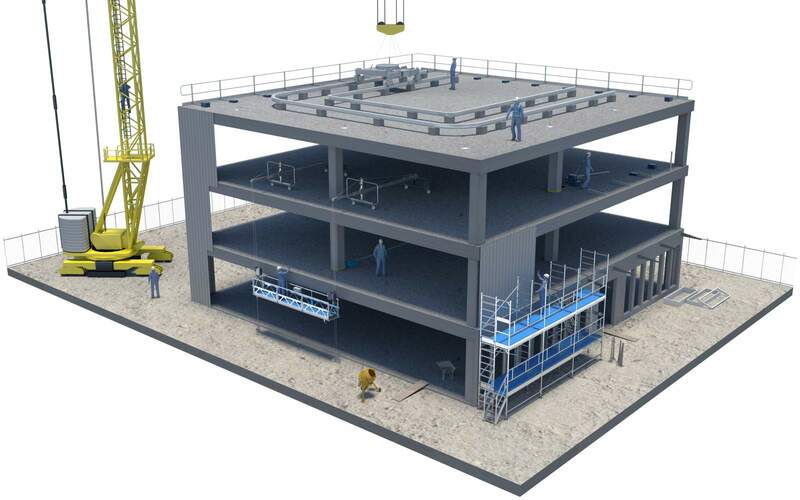 Activities at a construction site cover a wide range of work; from the main piling in the beginning of the process to erecting roof and facade elements near the finish of the project. Choosing the right safety solution per activity and location is often a challenge to workers and HSE officers. XSPlatforms is happy to help out and give advice on how to create a safe work environment for every possible situation. OSHA states that every employee in the residential construction that works at heights of 6 feet (1.8 m) or more must be protected by a guardrail system, safety netting or personal fall arrest system. If these measures are infeasible or create a greater hazard the employer must implement a fall protection plan that meets the requirements of paragraph (k) of 1926.502. Construction sites are often crowded with workers, carrying a wide arrange of tools and materials. Surfaces are often small, sometimes unstable or may have uncovered holes in them. Walking/working surfaces often have unprotected sides and edges, posing huge safety risks. A worker can lose their balance, trip over tools or debris that’s laying around, slip on a wet surface or any other cause, subsequently falling from height.